Shirley, Goodness, and Mercy know that an angel's work is never done, especially during a time as wondrous as New Year's Eve. With an apprentice angel, Will, under their wings, they descend upon Times Square in New York City eager to join in the festivities. And when Will spies two lonely strangers in the crowd, he decides midnight is the perfect time to lend a heavenly helping hand. Lucie Farrara and Aren Fairchild meet after bumping into each other - seemingly by accident - in Times Square on New Year's Eve. They immediately hit it off and find they have a lot in common: Lucie is a burgeoning chef and Aren is a respected food critic. But just as quickly as they're brought together, another twist of fate tears them apart, leaving Lucie and Aren with no way to reconnect. A year later, Lucie is the chef of an acclaimed new restaurant and Aren is a successful columnist for a major New York newspaper. For all the time that's passed, the two have not forgotten their one serendipitous evening - and neither have Shirley, Goodness, Mercy, and Will. To reunite the young couple, the angels cook up a brilliant plan: mix true love, a second chance, and a generous sprinkle of mischief to create an unforgettable Christmas miracle. I hear the whole book. I hope it won't take Debbie another 3 years before she finishes another book. Macomber's angles are at it again! 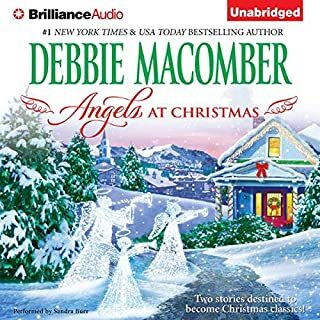 This is the latest, and best installment, in the Debbie Macomber 'angles' series. It seems like an updated, Christian fun redo of the movie, An Affair To Remember. The angles--Shirley, Goodness, Mercy, and the newest addition, Will are 'prayer ambassadors' from heaven who push the boundaries of their assignments. This time they cause two lonely people to meet in Times Square on New Years Eve. They have an instant attraction, but problems arise and the angels 'help' causes problems for the new couple. This story has a fun interest because the two people are a chef, opening a new restaurant, and a food critique for the newspaper. Since I enjoy shows on the cooking channel, this book ties in the food interest, romance, and fun with a Christian message. Good read for this Christmas season!! 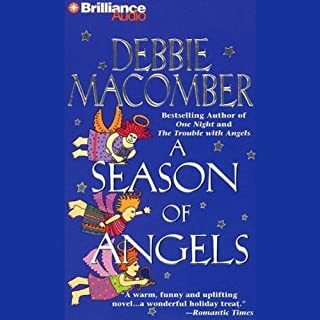 This is the first Debbie Macomber book I've read. Very sweet, and funny, with a happy ending. It scratches that CinderelIa itch of mine! Love the angels! What other book might you compare Angels at the Table to and why? This was my first experience of listening to a book. It was a good christmas story. I listened at Christmas. 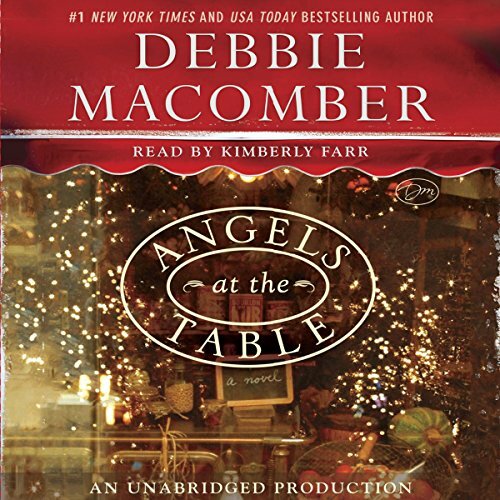 Would you consider the audio edition of Angels at the Table to be better than the print version? I thought the mischief of the the angels was pretty funny. What does Kimberly Farr bring to the story that you wouldn’t experience if you just read the book? What could Debbie Macomber have done to make this a more enjoyable book for you? What three words best describe Kimberly Farr’s voice? Loved the Christian theme, but just too predictable, didn't finish it. Yes - I love the stories this author tells. Did Kimberly Farr do a good job differentiating all the characters? How? OK - it is amazing the number of voices she can do. It would have to follow the story line of the book and not divert from the story like Mrs. Miracle movie did. That was a very disappointing movie. I loved the book and read it several times. Not understanding why there are so many rewrites of the same books that was published several years ago. I would love to see Debbie write some new stories instead of just freshing up the old ones. What did you like best about Angels at the Table? What did you like least? Fond of the author as a public figure and businessperson, but this story didn't hold my interest. Also, I felt like the performer was reading to a kindergarten class, so the repetitive bickering of the story became very slow and tiresome. I think I'll postpone finishing it for another day. 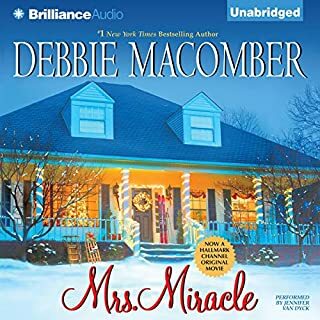 If you’ve listened to books by Debbie Macomber before, how does this one compare? I have listened to one other book section which was far more engaging. Would you listen to another book narrated by Kimberly Farr? Probably once more, to see if the experience improved. Can't tell if it was the reader or story that put me off. 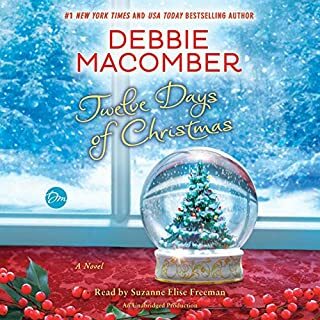 This is the first Debbie Macomber book I have "read" and will likely be the only one. The writing is simply not very good for an adult level book. Perhaps it has been written as such with the intention of being family oriented, but frankly I doubt children would be interested in the storyline. The premise of the story held promise, but the book simply does not hold up. The writing is quite simplistic and often redundant. It serms there is very little effort put into describing the characters feelings and experiences. For instance, several times she describes characters reacting by "frowning" rather than more accurately describing if they are upset, angry, puzzled, distressed, etc...there are a number of emotions which could elicit a frown, but she simply does not make the effort to be more descriptive or expansive. The author was also repetitive in her general writing style throughout the book. The idea of the story is pleasant enough and I like uplifting stories, but this was a disappointment. I agree with previous reviews that the angels were portrayed as being very dumb...yet continually commenting on how slow-witted humans are! The narrator affected my experience as well. The accents seemed possibly incorrect and at times inconsistent. The voice she used for the lead male character of Aren sounded very strange. She tried to speak so low for his voice that very little emotion or inflection could be properly portrayed. "His" voice sounded both strained (constipated) and quite monotone (= boring) so it was VERY unappealing to listen to his parts of the story (which are frequent). The parts of the story with only females were much better. 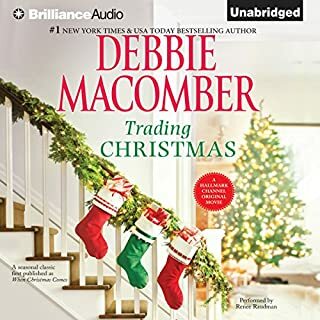 I would certainly recommend to the narrator to try not use such an extreme change in lowering her voice for male characters as it simply does not come across well in the way it was done on this audiobook. The general narration as well as the story I often experienced as too syrupy and shallow. The resolution between Aren and Lucie occurred, once again, in an over simplistic and unrealistic way. Additionally, for a contemporary book, the way it concluded was very provincial and conservative (narrow-minded even) as far as how the future would play out for the female, Lucie. 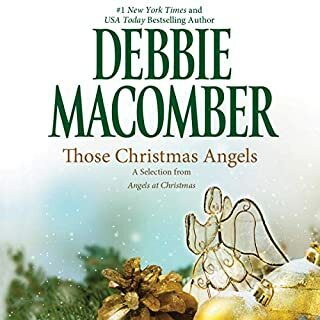 I had hoped for more after seeing and generally enjoying a few TV movies based on Debbie Macomber books, but this book did not deliver for me and I get the sense that the movies are perhaps transformed quite a bit from her books (unless this one is entirely different from the others). Wish I had had a better experience with this one! Sorry Debbie. This was an insult to Angels! What about Kimberly Farr’s performance did you like? She did good voices for the characters. The "Angels" couldn't do anything right. They were portrayed like bumbling little children who couldn't stop interfering in human affairs.